Most micro-cap resource stocks have been underwater since a four year high ended in early March 2011 with the Toronto Venture Exchange Index down over 50% since that time. Stock performance has been abysmal despite record or near-record prices for most commodities in 2011 and continuing high prices in 2012. Many factors have contributed to the decline in junior exploration and mining stocks and I see little evidence for a quick recovery. However, stock markets, and certainly yours truly, will always find something to be long on. That current something for me in the junior resource sector is graphite. Along with diamond, graphite is an allotrope of the semi-metal element carbon. However, it has almost the exact opposite physical and chemical properties. Graphite is gray to black, opaque with a metallic luster, a soft mineral with Mohs hardness of 1 to 2, and arranged in parallel hexagonal sheets. It is chemically inert and flexible, yet very strong. Graphite is of low specific gravity, highly refractory with a 3927 C melting point, and electrically and thermally conductive. Its unique characteristics have led to many industrial applications. Graphite deposits occur in high-grade metamorphic rocks that are widespread and abundant across the Earth. They tend to be small deposits that make low-cost mines. Graphite is much more than the lead in your pencil and the carbon fiber additive that lets you “grip it and rip it” with a big-headed composite driver. These uses actually constitute a small part of demand. Three-quarters of the world’s graphite is used in traditional applications such as steel-making, foundry moldings, refractories, auto parts, and lubricants. Minor uses include batteries, pencils, electronics, and numerous other products. Significant future demand growth is projected to include fuel cells, lithium-ion and vanadium redox batteries, and pebble-bed nuclear reactors. Development and commercial application of the much-ballyhooed graphene (single atom layer graphite) technology is a decade or more away. Synthetic graphite and carbon fiber are high purity, expensive forms produced from petroleum coke, primarily in the United States with significant exports to other consuming countries. 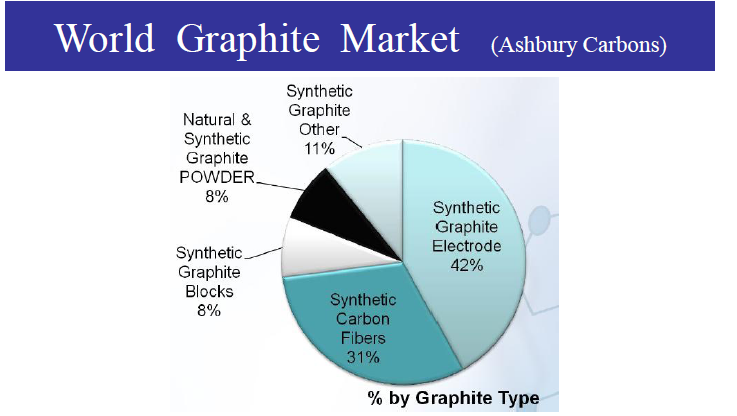 They constitute the majority of graphite demand. Natural graphite production is mainly from small underground mines in China. By the early 2000s, graphite mines outside of China were rendered uneconomic when it flooded the market and drove prices down. World production totaled about 1.1 million tonnes in 2011 with an estimated 75 % coming from that country. Other countries with significant graphite mine production include Brazil, North Korea, Canada, India, Romania, Ukraine, Mexico, Madagascar, Austria, Turkey, and Sri Lanka.